I did not pick out this week’s record specifically because it’s so radically different from last week’s, it just happened this way and I’m glad it did. It’s interesting to compare the two guitar-driven works. They are on opposite ends of the musical spectrum just like the two respective guitar-players, both brilliant for different reasons, have powerfully contrasting styles and an antithetical approach to songwriting. One is a technique-driven virtuoso with an almost scientific approach to songwriting and melody and the other is an avant-garde, experienced session-master with a vast and diverse repertoire, who takes melody, throws it in a meat-grinder, then sets it on fire, puts it in a hammerlock and hits it with a bull-wrench. I’ve written about Marc Ribot before and I think he’s one of the most entertaining musicians of the modern era. He’s also very much an acquired taste no matter which one of his many projects you check out. 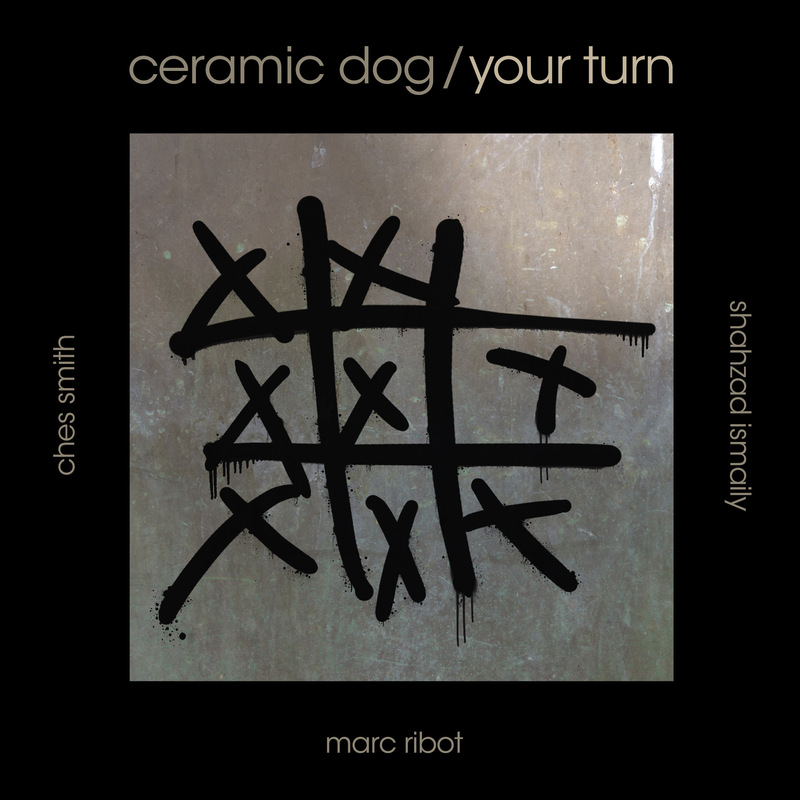 With works that range in scope, sound and delivery (not to mention decibels), Marc Ribot, one of the most versatile guitarists and songwriters in the world, seems to be having the most fun on his Ceramic Dog records. At least that’s how the music comes off to the listener. The sound is unkempt and unrestrained, a liberating experience for both band and audience as the three musicians spend little time worrying about the norms and conventions of modern music. The aforementioned band consists of Shahzad Ismaily on bass and Ches Smith on drums, both powerful players and impeccable technicians and, of course, Marc Ribot on guitar and sometimes vocals. The variety of sounds is amazing for a band that consists of only three musicians. The trio’s 2008 debut record Party Intellectuals was a ton of fun and it’s a work that still manages to sound fresh. Now, five years later, Your Turn proves a worthy successor; a more consistent but also more conventional record that documents the three musicians’ growth as a band. In my review of Party Intellectuals I said the record had “multiple-personality disorder”, meaning that the styles and sound of the songs contrasted powerfully which gave it its diversified sound but also its not-always-consistent quality. It was definitely a roller-coaster-ride but it felt like it lacked a common thread. Your Turn, on the other hand, manages to take a page out of Tom Wait’s book and offer variety while maintaining a distinct character throughout. It’s less experimental-noise and more hard rock which I think brings it closer to what Marc Ribot had in mind for Ceramic Dog in the first place. This consistency in its structure also makes it a tad more accessible as some of Marc’s avant-garde work (and I’m thinking primarily of his Rootless Cosmopolitans and Shrek phase) at times proved too hard to digest even for the most stubborn connoisseur. I’ve recently conducted an in-depth interview with Al Di Meola and what resulted is probably the most extensive article I’ve written for this website. It features my recount of the struggle of getting the 30 minute sit-down, a review of the concert as well as the interview in its entirety. A reader told me she thought the article was absolutely great, that “you can see it is well documented, and written with great passion” but that it is “too long to read when you don’t have much time but are dying of curiosity”. Her well-meaning feedback which completely missed the contradiction, painted a great picture of a society that craves quality and information but cannot stomach anything beyond readily-available light-on-content distractions and free entertainment. “Masters of the Internet” sums this up brilliantly. I also have to commend the excellent percussion on this song. The record continues with the instrumental track “Ritual Slaughter”, another vehicle for the band to show off their amazing skill and intuitive timing, after which “Avanti Popolo”, an interlude that would have seemed out of place on any other record (but not on this one) leads us to “Ain’t Gonna Let Them Turn Us Round” (or what Marc calls the Affordable Health Care Act song). I’m not an American so I don’t feel I have the right to comment on the context but I can make the statement that I feel this song delivers its message very efficiently. Powerful lyrics and passionate vocals, coupled with the angry energy of the instrument and the flawless timing of the musicians make this one of the most well-crafted songs I’ve heard in a long time. Also Marc’s “industrial” guitar solo is truly something magnificent, my favorite since his emotional guitar work on “La Vida es un Sueno” from his first Cubanos Postizos record. For “Prayer” Marc goes back to his roots as a Rootless Cosmopolitan (I can never pass up the opportunity to make a bad pun) as the band gets to go crazy with what I’ve already affectionately called “seizure music”, once again displaying masterful cohesion in an instrumental tour-de-force. They follow it up with the laid-back, bluesy and surprisingly catchy “Mr. Pants goes to Hollywood” and the mock-nostalgic “The Kid is Back” before taking a crack at Dave Brubeck’s “Take 5”. I’ve always been a fan of Marc’s cover songs, he adds his entertaining and eccentric spin on them ( see “The Wind cries Mary” or “Dame Un Cachito Pa Huele”); again, he does not disappoint. The record closes off with the funny, if somewhat juvenile, “We are the Professionals” in which the band parody the sound of the Beastie Boys followed by “Special Snowflake”, a quick instrumental mish-mash to close the curtains on another great album. I generally have nothing but praise for what Marc Ribot brings to the music industry, whatever form his projects may take. I find his entire body of work fascinating but I have to admit that I have a soft spot for Ceramic Dog. In the company of the musically like-minded Shahzad Ismaily and Ches Smith, Ribot seems to be at his most comfortable. The band takes the elements that make Ribot’s various projects great and combines them to produce the distinctive sound of Ceramic Dog. Their sophomore release is a commentary on the multi-faceted music industry but also it is simply one wild ride.